The West considers anxiety to be caused by a variety of factors such as life events, genetics, brain chemistry, and personality. However, yogis believe anxiety is a result of an imbalance of the root chakra, or the muladhara chakra in Sanskrit. According to author Anodea Judith, in her book Eastern Body Western Mind, anxiety occurs from a lack of grounding in the root chakra that can affect our lives by feeling a lack of security and physical ailments. In Ayurveda, the sister science to yoga, anxiety is caused by the vata disorder of having too much movement and wind in daily living. To address the anxiety is to address one’s lifestyle habits which involves slowing down, strengthening the body, and eating appropriate foods. Yoga often helps with anxiety because of the awareness and positive health benefits of the breath and the ability to learn how to tune inward as well as the ability to activate the parasympathetic nervous system to help calm the body. Postures that are grounding can help strengthen the root chakra. From an Ayurvedic perspective, to address lifestyle habits, yoga can help work with or eliminate disease also focus on grounding and strengthening poses to bring the body in balance. David Frawley, founder and director of the American Institute of Vedic Studies, recommends specific ways to adapt a yoga practice when out of balance. By practicing in slower calmer movements as well as strengthening postures, yoga can help pacify the vata traits. Before practicing yoga, it is important to contact your healthcare provider to ensure the practice is safe for the body and the mind. Additionally, while it should be noted that yoga can help with anxiety it should be practiced under supervision with a qualified teacher, preferably a yoga therapist or instructors with advanced forms of training, and that is should not be used as a form of treatment but as a complementary practice. Before practicing Frawley recommends practicing in a slower quieter room and to practice in a “slower, grounded and systematic way” holding postures for longer periods of time. While it may feel uncomfortable, it can help receive the benefits of the postures to assist in the managing of anxiety. Additionally, any postures that may not feel good for the body or if anxiety seems to increase can be avoided. Easy pose or sukhasana is recommended to relieve anxiety and stress because of its grounding effect and ability to sit with the breath. To start, discover how much support the body needs. Practicing yoga for anxiety requires a deep awareness of tuning inwards towards the body and noticing what is there in the present moment. Easy pose can either be completed by sitting with the back supporting itself or against a wall where the back is supported. Once a location is determined sit on top of a blanket and cross the ankles. The pelvis is neutral while extended the crown of the head towards the sky. Relax the shoulders and draw the awareness in towards the breath. While it may be challenging at first, try practicing this posture focusing on the breath for 3 to 5 minutes. Gate pose, also known as Parighasana, helps the body by strengthening the diaphragm. By strengthening the diaphragm and breathing deeply, the parasympathetic nervous system can be activated more easily decreasing the stress response in the body. To start, come into a kneeling posture with a natural curve in the spine and with the arms along the side body. A blanket can be placed underneath the knees for more support. Step the right leg out to the side and press the sole of the foot into the floor with the toes facing towards the right. Reach the left arm up towards the sky and hinge to the right at the waist while the right arm is placed on the right thigh or shin. Hold this posture for 30 to 35 seconds until completing on the opposite side. Standing postures such as Mountain Pose or Tadasana are good for anxiety for the ability to ground. Specifically, mountain pose allows practitioners to check in with the body in a more simple way to notice where they are feeling sensations in the body. Start standing with the feet a few inches apart. Try to root into all four corners of the feet. Engage the legs so pressure is lifted away from the knees. The pelvis should be neutral with the abdominals engaged. Try to lift through the rib cage while simultaneously relaxing the shoulders. Relax the face and the release any tension in the jaw. The palms are facing forward. Try to feel grounded through the body while simultaneously reaching the crown of the head towards the sky. Hold this posture for 45 seconds to two minutes. Practitioners should be aware while they are practicing to notice if they are blocking energy in the body. For example, Judith points out if the knees are locked the energy in the body is getting stuck as it pushes the belly forward which causes the chest to collapse and the head to move forward. Balancing postures such as tree can help practitioners focus on balance while turning inward especially when sometimes focusing in on the breath can cause more anxiety. When practicing tree pose, start in mountain pose. Again, noticing that the feet are grounded and the energy is free flowing in the body by avoiding locked knees and lifting through the crown of the head. Sovik even recommends standing next to a wall in case more stability is needed. While keeping the eyes on a focal point, take several breaths. Press more weight in the left foot and bring the right foot to the inside of the left leg with the knee pointing towards the right. Placing a hand on the wall can help feel more stable so the body can lift and strengthen. Continue to keep the gaze on the focal point and maintain the breath. Repeat on the opposite side for the same amount of time. Backbends can help open the heart. A gentle backbend that is easily accessible to combat the bodily stress of anxiety is cobra or Bhujangasana. To help make the posture more restorative on the body, a blanket can be placed underneath the hips. Lie on the stomach with the hands underneath the shoulders facing forward and elbows towards the body. The feet can either be together or hip distance apart or with the big toes touching. Gently lift the chest off the floor while relaxing the shoulders and lifting the crown of the head while keeping the gaze forward. To make the posture more comfortable, a pillow or bolster underneath the chest. This posture can be held for 30 seconds to one minute. Child’s pose (malasana) is widely known for its calming effect. In Ayurveda, child’s pose is known to reduce vata. It is also incredibly grounding and assisting the root chakra when it has been depleted. Child’s pose can be incredibly comforting on the body in wide leg child’s so there is more room to breath into the belly. Starting on hands and knees, bring the knees to the edge of the mat, let the toes touch, and bring the glutes towards the heels. Extend the arms forward while the forehead rests gently on a mat or a block and hold for one to three minutes while trying to bring awareness to the breath. Legs up the wall pose or Viparita Karani in sanskrit is a gentle inversion that can help reduce feelings of anxiety. By turning the body upside down it can result in changes in blood pressure and breath dynamics. Start by placing either two blankets or a bolster on the ground about five or six inches away from the wall and sit on top of the support with the side body pressed against the wall. Bring the legs up the wall while simultaneously lowering the back onto the floor. Try to get the back of the legs and glutes touching the wall but if the hamstrings, back, or hips are tight, they may need to be slightly away from the wall. Perhaps the most important posture for combatting stress is savasana (corpse) pose. As it can be challenging to get started with if the mind is busy, try to practice after doing several postures to help quiet the mind first. Use any props such as bolsters, pillows, or blankets to find comfort without falling asleep. If it helps, calming music can be played. With the eyes closed, try to simply experience what’s happening in the moment. Howevers if the mind starts ruminating on past experiences or through to do lists, tune in to the breath to help stay more grounded in the practice. Try to hold this posture anywhere between five to ten minutes. While yoga postures can help alleviate anxiety it is not always possible to practice depending on the environment. 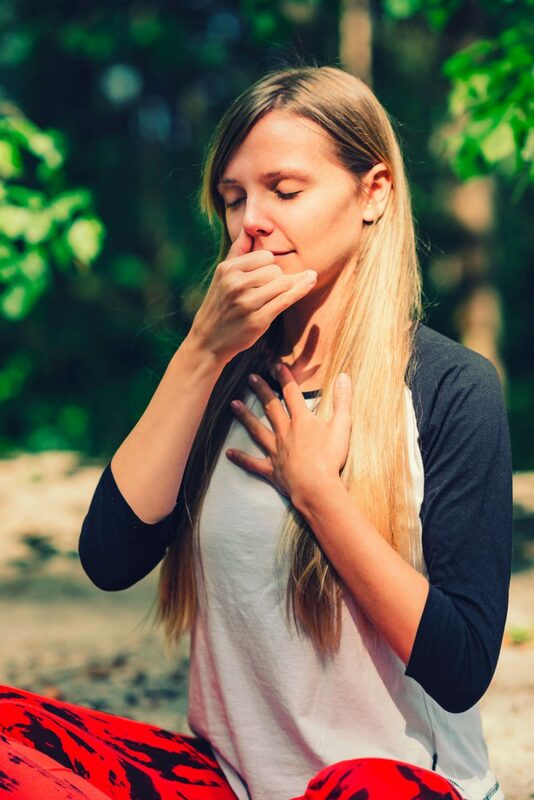 However, by practicing working with the breath pranayama practitioners may get more benefit out of the posture. In a study from Penn State, the researchers compared the results of yoga practice between 2 different groups. While both groups saw a decrease in anxiety, the group that practice diaphragmatic breathing had better results. To get a feel for the breathing, it could be helpful to start practicing with the hands on the body first in simpler postures such as easy pose or savasana. Try to soften the chest, belly and rib cage. On the inhale, expand the belly trying to keep the chest as still as possible without strain. On the exhale, release the belly down with the breath in a relaxed way. Breathing can help with grounding and decreasing vata in the body as well as activating the parasympathetic nervous system. While it may initially be challenging to practice breathing with the posture practitioners can start with some of the more basic postures and bring it into the rest of the practice as it becomes more natural. While individuals who have anxiety should always speak with their doctor before starting any other treatment plan, when practiced safely in the right environment, yoga may have some positive effects with managing anxiety.